DALLAS (AP) The Dallas Mavericks were left shaking their heads at Stephen Curry’s shot-making ability – and how they let him get one last great look at the basket. Curry’s long 3-pointer with three seconds to play allowed the Golden State Warriors to escape with a 125-122 win over the Mavericks on Wednesday night after blowing a double-digit lead in the final four minutes. On their final possession, the Warriors gave Curry the inbounds pass. A crossover dribble and a screen from Draymond Green were all he needed to get a clean look from 28 feet, which hit nothing but net. Dallas, with a foul to give, didn’t take it. ”Too open of a look for a game-winner for the greatest shooter in the game,” longtime Mavericks star Dirk Nowitzki said. Curry finished with 32 points and has 70 in two games since returning from an ankle injury. Golden State’s ”Big Four” combined for 100 points, and the Warriors needed every one of them against a Mavericks team that had won four straight. Kevin Durant and Klay Thompson had 25 points each, and Green added 18 to go with 10 rebounds. Wesley Matthews led the Mavericks with 22 points, including seven 3-pointers, and Dwight Powell tied his career high with 21. Dallas, playing from behind most of the game, wouldn’t go away despite trailing 114-102 with 4:32 left. Three turnovers by the Warriors and some cold shooting, combined with a sudden hot streak by the Mavs, enabled Dallas to tie the score at 120 on Harrison Barnes’ jumper with 39.9 seconds to play. 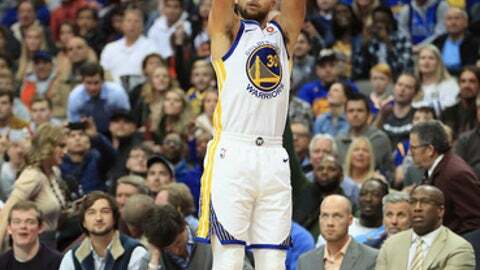 Thompson and Barnes traded inside baskets before Curry’s big shot in the final seconds. A long heave by Dennis Smith Jr. at the buzzer was way off. Golden State extended its road winning streak to eight games. The Warriors haven’t lost away from Oracle Arena since before Thanksgiving. Not only did the Golden State quartet produce 100 points, but one of the four was always there to step up. Curry scored 20 and Durant 16 in the first half, Green had 15 in the second half, and Thompson had 14 in the fourth quarter. Despite their 13-26 record, Dallas has won or played close against most of the NBA’s best teams. The one exception had been Golden State, which has won nine in a row and 16 of 17 against the Mavs and had dominated the two previous meetings this season by a combined 45 points. This time, Dallas fought back from deficits of 12 in the first half and nine in the third quarter, taking a lead at 84-83 on Devin Harris’ 3-pointer with 3:40 to play in the period. Warriors: Played without Andre Iguodala (back and hip strain) and Omri Casspi (back strain). Casspi’s injury occurred during the morning shootaround. Kerr said Iguodala would likely play Thursday at Houston. … Thompson’s second-quarter 3 marked the 92nd straight game in which he’s made at least one, the third-longest streak in NBA history. Mavericks: Reserve center Nerlens Noel had his cast removed Tuesday following left thumb surgery on Dec. 8. Noel hasn’t played since Nov. 22 and has scored just 72 points in 18 games for the team. Warriors: At Houston on Thursday in a matchup between the West’s top teams. The Rockets beat the Warriors 122-121 on opening night in Oakland. Mavericks: Host Chicago on Friday. The Mavericks have won four straight against the Bulls.